WebloG » Agile & more agile » Do you have a strong heartbeat? Everybody has a heartbeat, having a heartbeat means being alive, having a strong regular heartbeat contributes to a healthy body and is an indicator to the power and quality of life. And guess what… in agile teams, -projects-, departments and organizations it’s exactly the same. 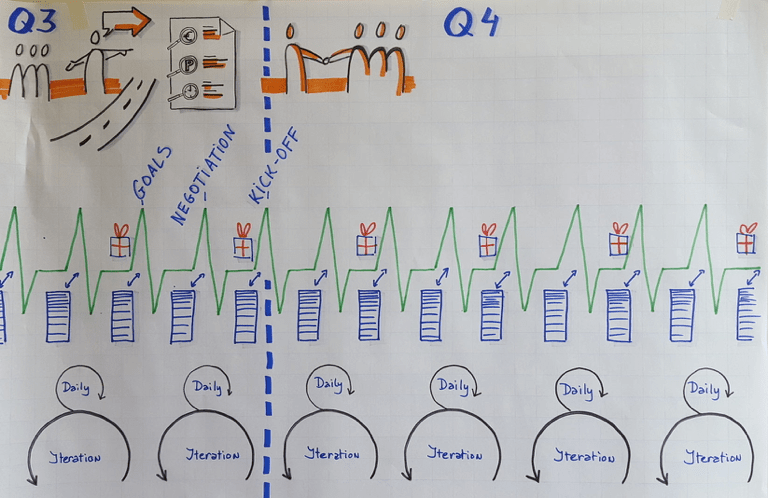 What is a Heartbeat session in an Agile environment? The Heartbeat session is the moment for alignment, verification and validation on all levels: team, project, product, department, company. A well organized and facilitated gathering where the agile team, or a representative, and all relevant stakeholders meet. They do so at regular intervals, for example weekly or bi-weekly basis, to ensure customer’s needs are being met, focus is on the right activities and impediments are removed. Alignment is what many organizations struggle with in an agile environment / culture. If teams only focus on their own product or project and don’t take the overall companies’ and client’s priorities and purpose into consideration we’re risking a non-aligned, chaotic and scattered customer value approach. In Heartbeat sessions with customers, internal and external stakeholders we create transparent interaction that ensures we’re all working towards the same goal (the Why), manage dependencies between teams and avoid gaps or duplication in what we do. How does our product or project align with the overall (company) goal? Are the right people involved & available? How does our work impact the rest of the organization? Are we working towards the same expectations & goals? Depending on the goal of the session we involve the right people; only those that actually bring value to the meeting! All others won’t join, so they can continue with the work at hand. Sounds simple, but it’s not always easy to manage, it requires strong facilitation skills to achieve maximum value and focus. Heartbeats take place at all levels at different intervals. For example: quarterly to determine the goals, prioritization and organization for the coming iterations (sprints), weekly to stay on track with the project / team and daily within the solution teams to manage the work & planning. If organized and facilitated well: it will take the right time, have the right rhythm, involve the right participants and have the right program to benefit all stakeholders. Successful heartbeats will lead to higher engagement, alignment, less waste, focus on higher customer value and momentum. Having a strong Heartbeat structure is vital for every organization, no matter what your industry or who your customer is!